With Valentine’s Day just around the corner, here are some of my latest finds for you to stock up on. My friends at Lynfred Winery, which happens to have a very romantic B&B near Chicago, sent over two of their prized wines for me to try and they were both a hit with me. The Lynfred Reserve Chardonnay has the butter and vanilla of oak, but goes down extremely smooth. An entirely different wine is the Lynfred Nero d’Avola. This Italian grape is a bit fruity, with a strong white pepper and just a bit of dryness on the finish. Last time I received Locations Wine, the brainchild of winemaker David Phinney, it was Argentina, France, and Spain. This time, the red were from the United States, California, Oregon, and Washington – the three most recognized red wine regions in the country. Tasting these Locations Wines was a lot of fun for me as a way to introduce my friends to the subtle differences in wines based on climate or, as Phinney puts it, location. He picked what he felt would be the best reds from each spot and all spent 10 months in oak (the Washington is a combination of American and French and the rest were all in French). The Oregon is 100% Pinot Noir. It is the lightest in taste and color. On its own, it’s a good wine, but it didn’t stand up against the two tough competitors. The California is a blend that sounds unique (Barbera, Grenache, Petite Syrah, Syrah, and Tempranillo), but it works very well. It’s filled with deep dark fruit and gives testament to some wonderful grapes from Mendocino, Napa, Sonoma, and the Sierra Foothills. The Washington wins the prize of impressing the most from those who don’t taste a lot from this region. The blend of Syrah, Merlot, and Petit Syrah is lighter than it would have been from California, with a hint of white pepper and subtle blackberry. This is definitely one of the most unusual things I’ve been able to try in a while. Partea is a booze infuser with less than a gram of sugar and a lot of flavor. You fill the mason jar with a “tea bag” with the liquor of your choice and let it infuse for a day or two, before putting your cocktail together, or simply serving it over ice. I did the Wild Berry with vodka and the Jalapeno with tequila. 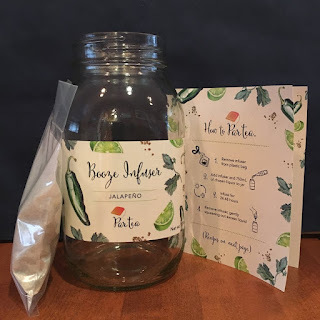 I can’t say the Wild Berry was very flavorful, but I really liked the Jalapeno. It made an excellent margarita. It was 25 years ago (1972) that the Rolling Stones had their legendary Tequila Sunrise Tour. Jose Cuervo is commemorating this event with a special limited edition Rolling Stones bottle. Additional limited edition bottles have also been released by Cuervo as the tequila celebrates its 222nd birthday. Other bottles pay homage to: The King of Spain, who in 1795 granted Jose Antonio de Cuervo. a royal concession – the first -- to produce tequila commercially; Aqua del Diablo (Devil’s Water) that first crossed the U.S. border in 1873; and A Special Lady, Ana Gonzalez-Rubio y de la Torre, who was the ground-breaking woman who led the Jose Cuervo company after the Mexican Revolution. Put Jose Cuervo Especial® Silver and orange juice in a shaker filled with ice. Slowly add grenadine in glass. Garnish with an orange wedge and cherry. Even though I do not follow a gluten free diet, I occasionally receive gluten free products to try out. This month I’d like to give a huge shout out to BFree. They make an assortment of breads, rolls, and bagels that are all gluten free. I was amazed how soft and tasty these were. I never would have guessed the white roll, at only 120 calories. Since I had some to spare, I even crumbled some up and put it under the broiler and made BFree bread cubes for my Italian Meatballs. No one noticed the difference.